I Heart Robotics has posted a guide for building your own clean room. They’ve been clever with their materials, starting with heavy-duty shelving to provide the framework. We like that idea, it allows you to position your workspace at whatever height you desire. The side walls are MDF painted with white enamel. Light, power, and tools are mounted to these walls. To keep things clean, a ventilation system uses a vacuum filter and 12V fans to keep filtered air moving in and dirty air out. Maybe now we’ll be able to pull off that window hack without killing our hard drive. I’m lost on how one might get his hands into the unit, though. Is the user supposed to lift the curtain while the clean room is being used? why is there a soldreing iron in the clean room? Kind of neat, though, if I were going to do the stupid hard drive hack, I’d do it on one I wasn’t actually using (ex: an old 10 gb, and just plug in the power so it spins but does nothing else). The “clean room” has positive air pressure relative to the surrounding environment, so if there is an opening (like the user putting their hands under the curtain), then air should only be flowing out. Personally I am not convinced at how much air pressure he could have inside that space with such a small fan pulling through a filter designed for a blower many times more powerful. Especially since it doesn’t appear that he made any attempt to seal the seams on the MDF panels. But the concept itself is sound. Wouldn’t it be better to use a shop-vac with a hose connected to the exhaust as the air induction system? Sure it’s louder but you’ll get a lot more airflow and just as much filtration. That’s not a clean room, that’s a glove box without any gloves opening. To sum up it’s a stupid waste of money giving you a false sense of security while achieving absolutely none. It attains absolutely no goals. It’s not even a matter of liking the way it’s done or not. It’s a matter of looking at intended purpose, looking at that contraption and realizing that it fails to accomplish ANYTHING in the good direction. Not even a correct naming of said contraption. The inlet fan is 120VAC and 22 Watts and produces 65 CFM of airflow. The airfilter I am using right now is not a HEPA filter, but there is a HEPA filter that has the same ends except it is longer. To improve airflow I would probably upgrade to HEPA filters, and add another fan and filter assembly, then build a glovebox inside the workbench to recirculate airflow. The seams where the MDF meet are sealed with blue painters tape so I can disassemble things if I have to move. To use the cleanroom you just reach right under like shown in this picture, the airflow over my arm seems pretty good but obviously that is a qualitative measurement. Also, I am using the cleanroom for disassembling laser scanners and applying LCD screen protectors, so I don’t need it to be that clean. I’m looking to borrow/buy a particle counter and test the clean room in the next week or so. In the future I’m thinking about building microfluidic and MEMs devices which will require a higher class cleanroom. Perhaps we ought to do our homework first.. This ought to be called something other than ‘clean’.. tidy maybe, but definitely not clean. thanks to MS3FGX for helping me to understand where your hands might go in such a ghetto cleanbox, and why you wouldnt be making it dirty by opening it a little. Here is a quick video that should give a better idea as to how it all works. This won’t match the particle count of a high class clean room, but it should be a heck of a lot cleaner than a regular work area. For even better performance gloves and lint free arm coverings could be employed, along with higher airflow, especially while working inside of it. It could even be possible to make your own glove box with some extra shower curtain material and a pair of gloves. Definitely needs some refinements but it’s not all THAT bad. More powerful fan and maybe another round of a more appropriate kind of tape around the edges? Probably be better to pick up one of those cheap plastic sandblast cabinets from harbor freight and modify it with an internal hepa filter. Put stuff in, close the door and run the filter for about 20 minutes. Should keep the dust down. By the way, I’ve done the drive window hack in my bathroom. Drive ran just fine afterwards. Only reason I don’t still use it is because it was an older 20Gb drive and I replaced it with a bigger drive. Ran with the window for a couple years. I am surprised nobody suggested this but why not replace the clear plastic with some plexiglass that has two holes and get some rubber gloves. put the gloves in the hole and make a seal like an air tight incubator? At the top of the plexi put in some hinges so you can open it to put in projects. At the bottom put some kinda latch so it stays put and around the perimeter make sure there is a seal to make it air tight when in use. Hmmm…. Would certainly be cleaner than my kitchen. Of course instead of a soldering iron I’d have a flask on a stir plate and test tubes for yeast propagation (homebrewing) but cleanliness is still necessary. Add a real hepa filter and correspondingly better blower. If the only place it is open is the bottom and there is positive pressure should be clean enough for yeast work. It’s like opening an Earth 1950’s themed Blood Soda Fountain on Qo’noS. Not a good idea. Blood Pie does not go well with Root Beer Floats. Use grow tents/rooms for clean rooms…. goofy i just saw his makerbot filter holder on thingverse yesterday. he said it was for a glove box, but where are the gloves? 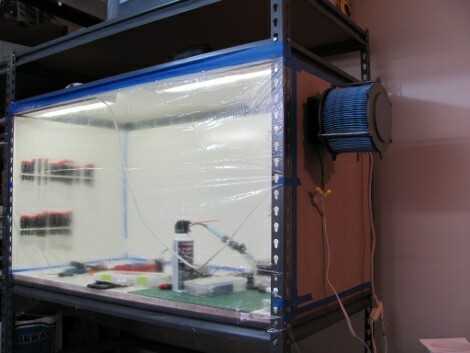 This is more like a HEPA work bench [Laminar Flow Station] http://www.aircleansystems.com/processprotection.htm. If you wanted a more effective HEPA bench system, put two vacuum cleaner motors on either end of a large diameter perf pipe [normally used for drainage] across the back top for your clean air supply. You could use bag filters from upright vacuum cleaners inside the pipe for extra filtering in case there’s a problem with the external filters. Moving the vacuum motors away from the bench and piping the supplied air will greatly reduce noise. Putting the motors in old speaker cabinets will reduce noise further but creates particulate problems. For a glove box make the front hard, put some needle point frames on the hard front to hold gloves, get some Obstetrical Sleeve Gloves, [a big animal veterinary supply will have them] and clamp them in the needle point frames. A manometer made out of clear plastic tubing and colored fluid will help monitor the positive pressure inside your glove box and tell you if there’s leaks or the filters are clogged. I also happen to work in a cleanroom environment manufacturing Pharmaceuticals and use Laminar Flow Hoods on a daily basis. Theres a few design features that true Laminar Flow Hoods use that yours doesn’t that could be incorporated into your design. The location of the air intake should be moved to directly in front and below the opening on the hood. This is so that if any air would attempt to go in the hood (Surpass the positive pressure) the region of negative pressure in front of the entrance to the clean area would be likely to suction the air. Our hoods also employ a much larger air transfer rate. Their motors use an extremely high flow rate to replenish the air within the hood almost constantly and maintain a 0.2+ Psi differential to atmosphere (The Clean room Surrounding). A little gowning information. You do not want to be working with bare hands in this kind of environment, the amount of shedding that your skin does will tarnish your work extremely fast. We use double gloves, the first pair is put on outside of the hood, where the second is removed from the wrapper and applied after the hands have been inserted into the hood. A fluorescent UV lamp is also a good addition if there is any concern about biologicals in the cabinet. I’d also clean it regularly with isopropyl alcohol (Which will evaporate faster than water and leave no residue). On cleaning it, one of those pet hair sticky rollers used for getting dandruff and fluff off clothing will be good for finishing cleaning in your particle controlled space. The masking tape used to seal cracks should be eventually replaced with something more permanent as old masking tape sheds, shrinks, and looses adhesion as it ages. Some tyvek coats or even tyvek bunny suits would be over kill but using a clean plastic trashbag as an apron [slit it to fit over your head and arms] and trash bags as sleeves will help keep material out of your controlled space.